Two of our miniature orchids are generating a lot of excitement this week. 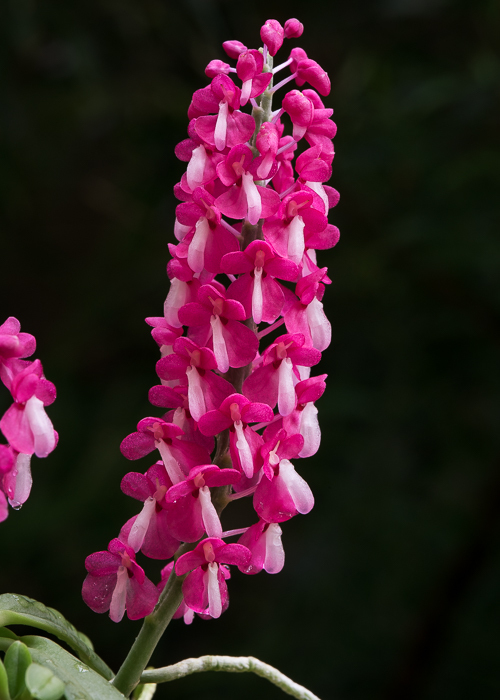 Dyakia hendersoniana, all of five inches tall, has the kind of electric fuchsia coloring that is visible across the greenhouse. 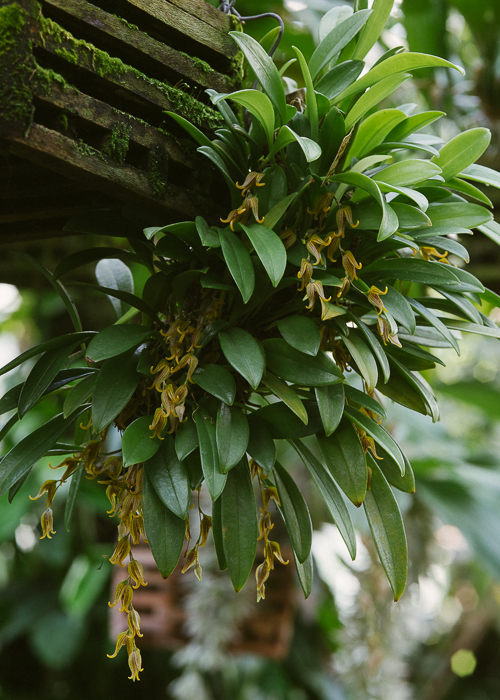 Dyakia hendersoniana grows as an epiphyte in primary and old secondary forests from 0 to 700 meters elevation in areas of high rainfall on the island of Borneo. The column and lip are white, and the lip has an elongated spur. Since my reference states that this is now a very rare species and endangered in the wild, I took this minute specimen to my office for pollinating. 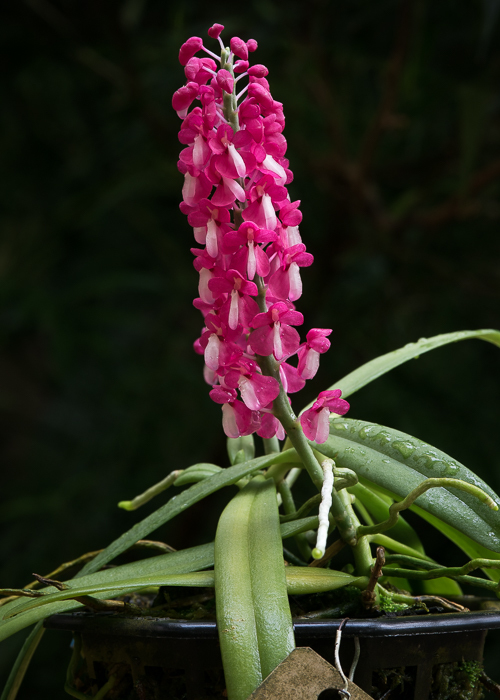 Tiny orchid flowers with spurs are (for me at least) one of the supreme challenges in orchid pollination. Removing the tiny anther cap and maneuvering the two pollinia into the stigmatic cavity without dropping them into the spur or onto my desk requires enormous patience and a steady hand. Usually, after I've dropped a few and I finally have the pollinia correctly positioned, they perversely refuse to release from the tip of my pencil. I am, as ever, amazed that insects can effortlessly accomplish this. Pleurothallis tripterantha makes a perfect tiny specimen plant with pendant chains of honey colored flowers. It is an undemanding little plant that seems to always be in flower (perfect, in other words). We grow our plant in an intermediate temperature greenhouse in 80% shade. Pleurothallis tripterantha is widely distributed from Costa Rica through northern South America in wet montane forests at 900 to 2700 meters elevation.